The story behind this long-lingering title is a strange one. Mike Phillips was due to stop by for a guest post back in August, but we missed out due to crossed wires at the tour company. When he requested a review a few months later, he had no idea that what he thought was his first stop really should have been his second. So, while the book itself hasn't been lingering on the shelf for too long, I feel like the opportunity to feature him has. Any way, that brings us to The World Below, book 1 of the Chronicles of the Goblin King. A sort of urban fairy tale, this is the story of an ordinary man who was only looking to start a new life, but who finds himself pressed into the role of hero. I hate to draw comparisons, lest I set an unfair expectation in the reader's mind, but the story reminded me of a grown-up version of Labyrinth. 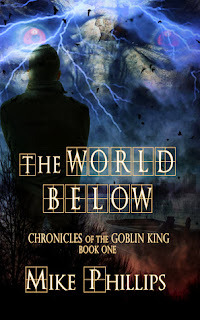 It's very much a story for adults, but it maintained that same sense of magic, mystery, and wonder that I remembered from my childhood adventures with the other Goblin King. The world-building here is simple, but strong, and there's more than enough historical back-story provided to establish the credentials of the world below. I might have liked a little more world-building, and a little fantastical detail, but that's more of an idle wish on my part than a complaint. The characters here, good and bad, are very well-drawn, especially for the kind of story where the 'strange' is so often pushed to the forefront as if it needed no character development. I'm not sure if Elizabeth simply paled in comparison to Mitch, or whether there are subtleties to her that will be exposed in later volumes, but something about her nagged at me. Mitch, of course, is a fantastic epic hero - as humble as he is human, and as sympathetic as he is sincere. I know the term gets thrown around a lot, but this really was a 'magical' book that thoroughly entertained me. It's one I've deliberately kept aside, returning to it between other review titles for a bit of an escape, and a reminder of what fantasy can do. Do yourself a favor and check it out.